The Trans Canada Trail is the worlds longest networked multi-use recreational trail system that consists of more than 16500 kilometers of the fully operational trails across Canada. It is currently about seventy three percent of the overall proposed routes and when fully completed should span over 22500 kilometers from the Atlantic Ocean to the Pacific Ocean to the Arctic Ocean, across every province and territory, connecting thousands of communities and all Canadians. “The Trans Canada Trail inspires Canadians of all ages to get active and keep fit and helps educate individuals of all ages about Canada’s history and cultural and natural heritage”. Every day Canadians and international visitors use these trails to walk, bike, ski, canoe and snowmobile along. Several information Pavilions have been established across the system to provide information about sections of the trail helping people to experience Canada’s unique landscapes. The Trans Canada Trail Organization does not actually own or operate any of the trails but provides a non profit organization to helps run and manage the community based project with the different sections owned and maintained by various local organizations, provincial and national agencies and a multitude of municipalities. The Trans Canada Trail Map web site offers an interactive Trans Canada Trail map based on ESRI technology that provides users with a new way to explore and learn more about the Trans Canada Trail System. The interactive site encourages public input providing functionality allowing Canadians to place points or lines on the map marking different parts of the trail that they may have explored or places that they wish to explore as well as opportunities to upload photos and stories to help share their experiences with other Canadians. The online web map offers users the ability to explore the trail system for areas that may be more suitable for different activities such as biking, canoeing and cross-country skiing as well as search tools to help find parts of the trail network near you. The City of Prince George has released an updated version of their PGMap online web mapping Application. 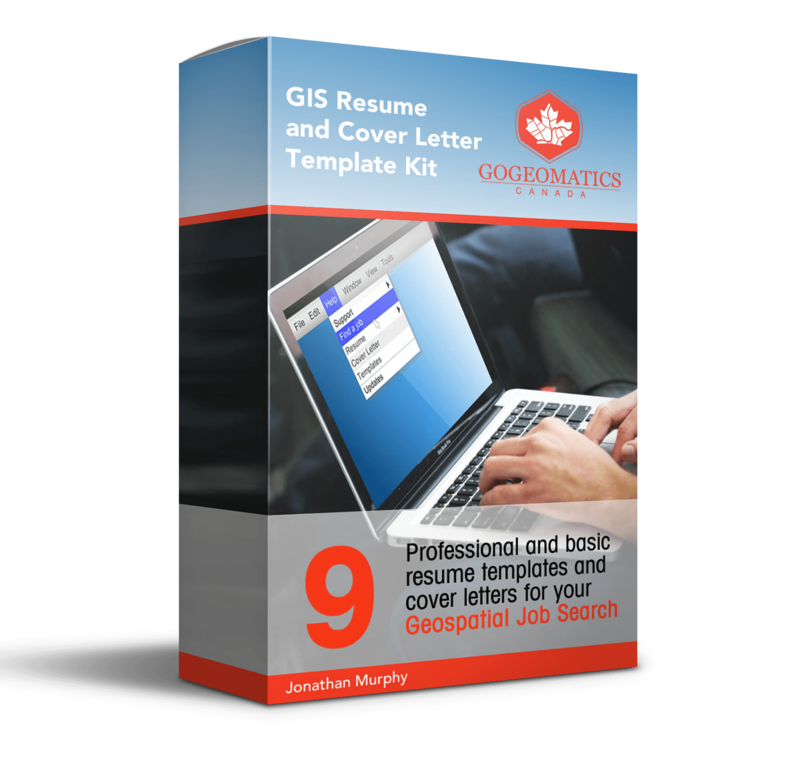 PGMap is what they refer to as the “On-line Geographic Information System” for the City of Prince George, British Columbia. PGMap was created and is provided free of charge to the public to use for viewing and searching property boundaries, aerial photography, legal descriptions, parcel information, verify zoning and various other City boundaries. On April 23, 2012 thousands of electors headed to the polls for Alberta’s 28th provincial election. In all 87 candidates were elected to the Legislative Assembly of Alberta, 4 more then 2008 due to an increase in the provinces growing population. The Progressive Conservative party won a majority with 61 of the 87 elected ridings. More information about Alberta general elections can be found at the Elections Alberta website. 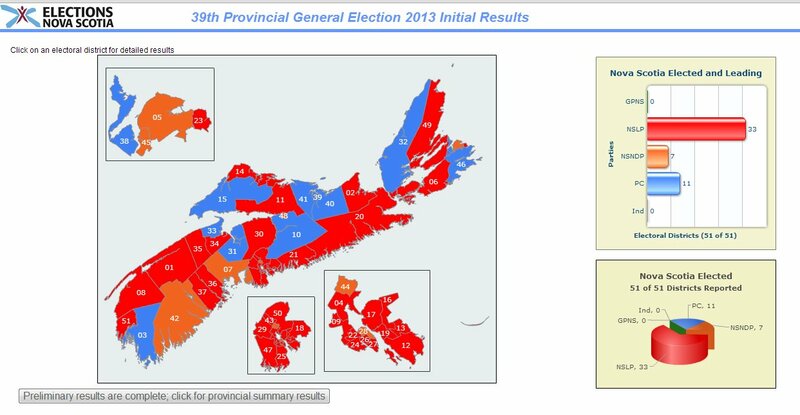 Instead I will continue to discuss Alberta’s 28th provincial election but as it relates to mapping, but what does a provincial election have to do with mapping? Well… ESRI Canada has what they refer to as a Public Map Gallery that is a collection of custom web maps created by their mapping team featuring Canadian community maps, Canadian election results, and various census data. 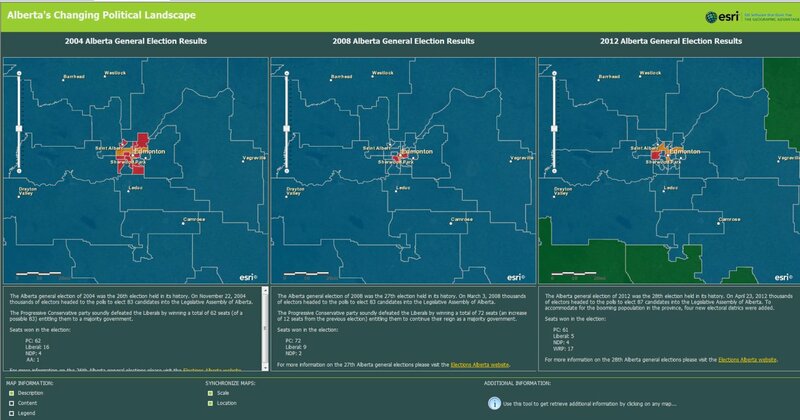 Here they leveraged some of their online spatial tools and features available together with public domain data to create an interactive online mapping application of Alberta’s Changing Political Landscape. 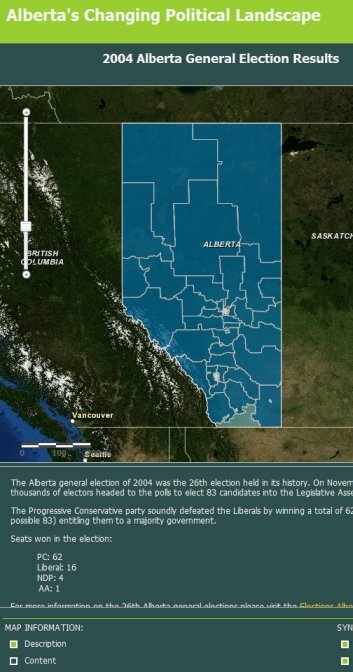 The online interactive political map can help people visualize the results from Alberta’s past three provincial elections all together in one interactive browser window. 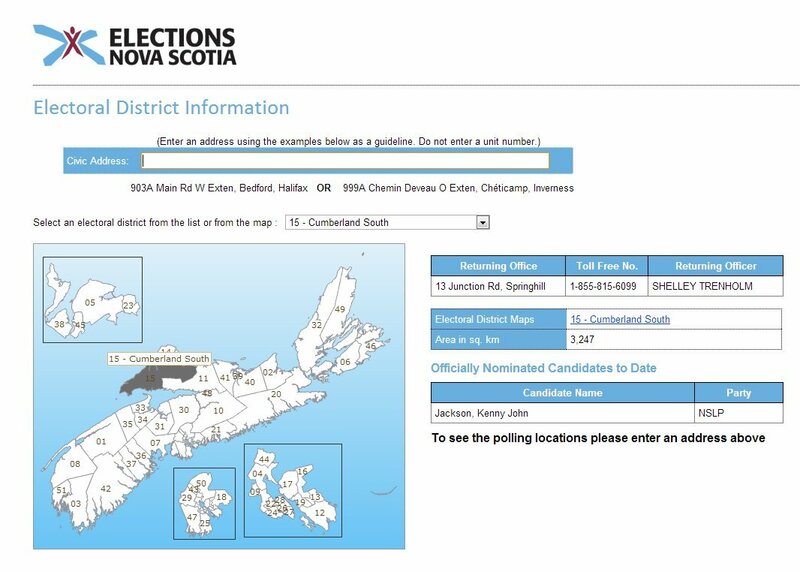 A similar online mapping application like this one was also created for the last federal election in 2011. Using the interactive mapping application of Alberta’s Changing Political Landscape a person can view results from Alberta’s 2004, 2008, 2012 elections and when they zoom into an area of interest in one map window, all the other windows will zoom to the same level automatically making it very easy to compare the results from place to place. 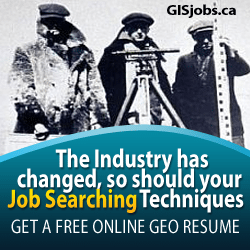 Do you know about any Canadian online web maps that are not covered by CanadianGIS.com? Then let me know and I will look into adding it to our database. 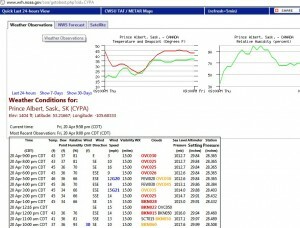 This link to an online web map was emailed to me recently and although it contains mainly American weather stations there are a good number of Canadian ones on there as well so I thought I would share it. NOAA (National Oceanic and Atmospheric Administration) is an an Operating Unit of the U.S. Department of Commerce that provides a National Weather Service. The Weather Service provides weather, hydrologic, and climate forecasts and warnings for the United States, its territories, adjacent waters and ocean areas, for the protection of life and property and the enhancement of the national economy. 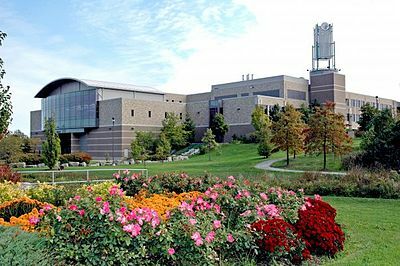 Their operational server maintains a current database of meteorological and hydrological data, historical data, and written information generated by the NWS or other official sources. In addition, their server accesses in real-time a selection of current weather observations, forecasts, and warnings from U.S. government sources for use by the national and international community. They also offer many other Weather services on their website such as storm watch, alerts, local and regional information and much more. 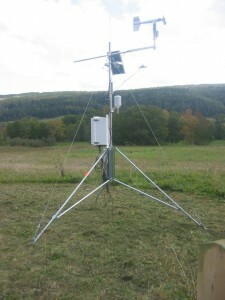 Moving the cursor over one of the symbols on the map will reveal data for the weather station of that area and is usually clickable, opening another web page with more information, details and measurements. It would be nice if they could expand a little further north to include all of Canada but in the mean time if you are located in Ontario, the Prairies or the Southern Rockies then maybe you can make use of this interactive weather mapping tool. 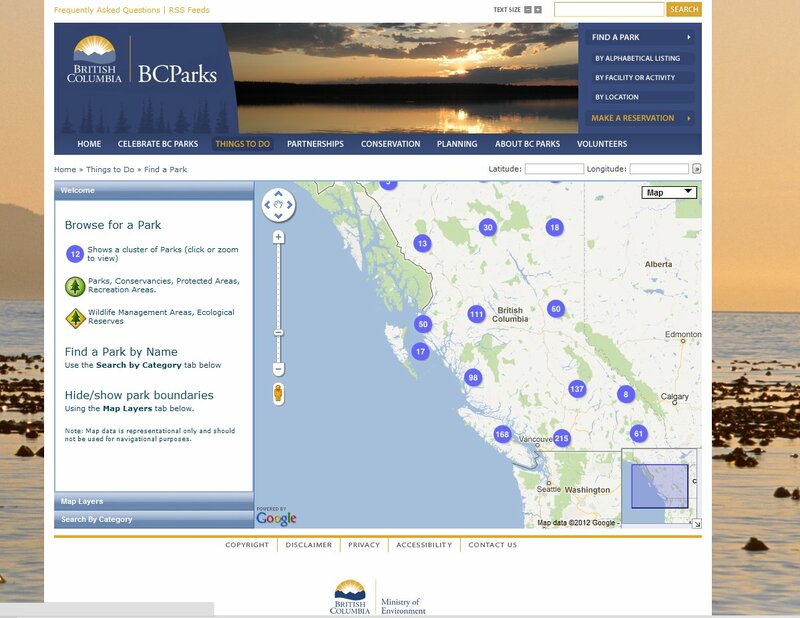 BCParks has created a simple online mapping application with data from the DataBC program to help people in British Columbia find things see and do in British Columbia by identifying the various locations of the Province’s Parks, Protected Areas, Recreation Areas and Ecological Reserves. 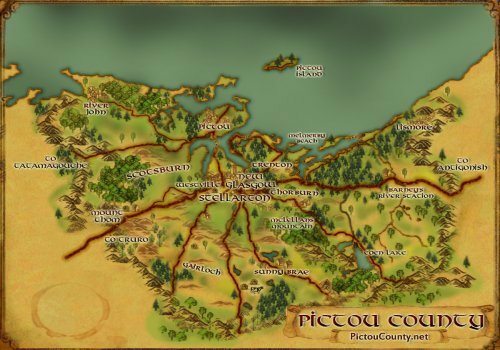 The online interactive mapping tool based on the Google Maps platform offers various searching abilities and provides users with some control over the features and map layers that are displayed in the mapping window. 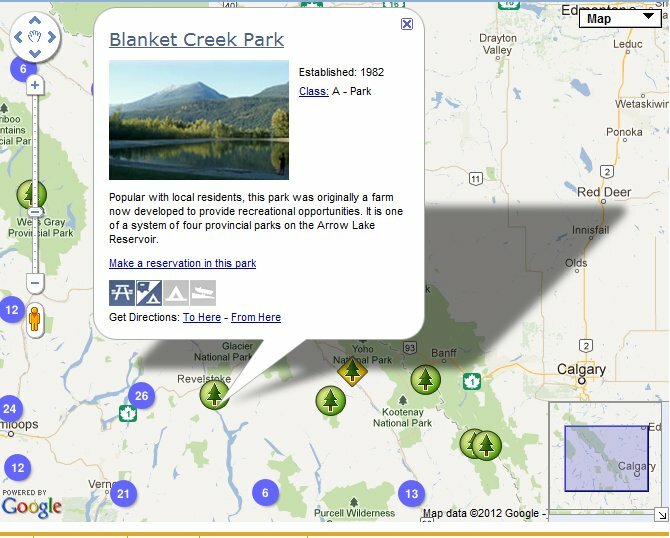 Points of interest in the map window feature places like Provincial Parks that are also interactive when clicked, providing basic information, photos and links to the respective web pages for that feature that can provide more adequate information. Although this online map may be relatively pretty basic it still does a good job of providing people with the ability to interactive spatially, appreciate the vast geography of British Columbia and find information about things to see & do that they may have not discovered before. Click here for more information about the The DataBC program.